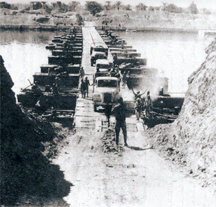 Egyptian forces cross a bridge over the Suez Canal on October 7, 1973, during the Arab-Israeli War. Photo from "President Nixon and the Role of Intelligence in the 1973 Arab-Israeli War." Courtesy U. S. Central Intelligence Agency. Back in March of 2001, I suggested that Curmudgeon Teams could be an aid in group decision-making. Although the idea was original to me, I've since learned that it isn't original. And experience with clients since then has given me opportunities (read: created the need) to elaborate the concept in the level of detail needed to actually use it. In this post, I'll review the idea, fill in some of the history I've learned about the idea, and record some of those missing details. questions about those proposalsbasic idea is that formalizing the role of questioning proposals that are gaining momentum provides safety to those who raise questions about those proposals. That safety enables them to raise more difficult questions, which filters out weak proposals and makes sound proposals even stronger. Curmudgeon Teams can also mitigate the risk of several different group process dysfunctions, including groupthink, shared information bias, and Trips to Abilene. The idea of Curmudgeon Teams was original to me, but it wasn't original. It has a history that includes the canonization decisions of the Roman Catholic Church before 1979. The role, which was called "Devil's Advocate," was responsible for arguing against the canonization of candidates for sainthood. The purpose of the role was to ensure that canonized persons were truly worthy of sainthood. In a second example of the use of formalization of skepticism, the history of the function also includes the report of the Israeli Agranat Commission that investigated the decisions that led to Israel's failure to anticipate the 1973 Arab-Israeli War. Following the surprise attack on Israel in 1973, the commission recommended changes in military and intelligence doctrine. As described by William Kaplan in his book, Why Dissent Matters [Kaplan 2017], "The Tenth Man is a devil's advocate. If there are 10 people in a room and nine agree, the role of the tenth is to disagree and point out flaws in whatever decision the group has reached." Read an excerpt of Kaplan's book here. Other forms of the role include Red Teams and white hat hackers. It isn't enough to merely create the Curmudgeon Team and let them have at it. Using Curmudgeon Teams can be tricky, because the role is inherently oppositional. Here are some guidelines that manage the risks and enable the Curmudgeon Team to make valuable contributions. To manage the risk that relationships with Curmudgeon Team members might be damaged, rotate membership in the Curmudgeon Team, either on a periodic basis, or from decision to decision. Membership rotation propagates appreciation for the challenges of the role, thereby enhancing safety for Curmudgeon Team members. Curmudgeon Team members need access to all relevant information any member of the larger group has. Delaying access, limiting access, or making it inconvenient to access compared to the access of the rest of the group can put Curmudgeon Team members at a disadvantage. That can limit their ability to perform their function. It can also reduce their credibility with the rest of the group. At the outset of any group discussion, real or virtual, the facilitator or chair introduces the Curmudgeon Team members as members of the Curmudgeon Team. This reminds the other group members that the contributions of the Curmudgeon Team members are purposefully skeptical, and that the role is important and valued. In live group discussions, real or virtual, the facilitator ensures that Curmudgeon Team members have access to the discussion that is no more limited than the access provided to anyone else. For example, the Curmudgeon Team members aren't relegated to dial-in access when other group members have face-to-face access. Access parity is necessary because the contributions of the Curmudgeon Team members are very likely to be unpopular. Providing inferior access to the discussion communicates the latent message that the Curmudgeon Team contributions are not only unpopular, but also of low value. If the group is charged with producing deliverables in written form, the Curmudgeon Team members are empowered to produce their own deliverables in written form of stature equal to the larger group's report. That is, the Curmudgeon Team report is not an appendix to the group's report. It stands on its own as a separate document. The two deliverables are produced in parallel, with each set of authors having equal access to the other authors' work. In some instances, some people might contribute to both reports. Raising thorny issues that the group must take seriously does require a high level of competence and thorough understanding of the substance of the discussion. (See "Asking Brilliant Questions," Point Lookout for November 22, 2006) Members of the Curmudgeon Team must prepare to play the curmudgeon role at a high level. The more valuable contributions of the Curmudgeon Team are in the form of issues raised about the substance of the discussion. Rarely is it helpful to raise issues about the professionalism, competence, or motivations of participants in the discussion. Legitimate questions of personal performance are best presented in private to the team lead or to cognizant managers. Every group abides by a set of norms regarding respectful discussion. Norms vary from group to group, and what passes for respect in one group might seem disrespectful in another. Still, every group has norms. Because members of the Curmudgeon Team are expressing inherently oppositional views, they would be wise to adhere to group norms more strictly than do general members of the group. Would you like to see your comments posted here? rbrenmwUPHPYdpuCOktrJner@ChacJvlcpgSktLtNrhDRoCanyon.comSend me your comments by email, or by Web form. I offer email and telephone coaching at both corporate and individual rates. Contact Rick for details at rbrenYYVKZasrEeOBxSLvner@ChacGVRmeUFRWxWeWFYioCanyon.com or (650) 787-6475, or toll-free in the continental US at (866) 378-5470.